Increase the beauty and abundance of your perennial garden flowers by putting nature to work. Beneficial bees, butterflies, and many other insects are the best and most efficient pollinators in the world. And the most effective way to use them to your advantage is by giving them a safe haven in which to hide and lay their eggs. Our Beneficial Bug Nesting Habitat features a thoughtful design that includes hollow bamboo canes, drilled holes and other places for beneficial insects to take refuge. 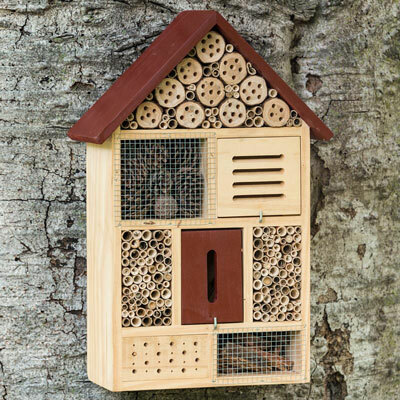 It's designed to meet the needs of a variety of insects, including bees, ladybugs, lacewings and butterflies. 18.5"H, 12"W and 5.5"D.